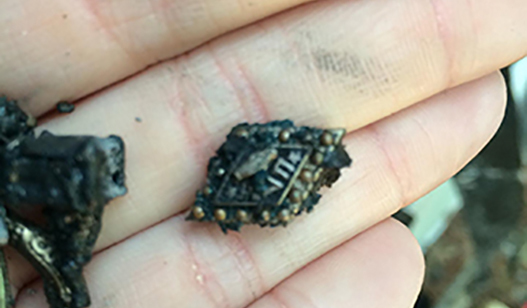 Alpha Delta Pi badge after her home was destroyed by fire. The Clasped Hands Fund Grant provides emergency financial assistance to alumnae who find themselves in financial distress. Need and circumstances determine the amount of each grant. The Clasped Hands Fund started with contributions received at Grand Convention in 1993. The fund was endowed in 1997 thanks to the generosity of Deen Day Sanders, Beta Sigma—Mercer University. For many years, gifts to the Clasped Hands Fund were recognized with a silk violet tied to attendee nametags at Convention; a violet appliqué was introduced at the 150th Anniversary Convention in 2001.